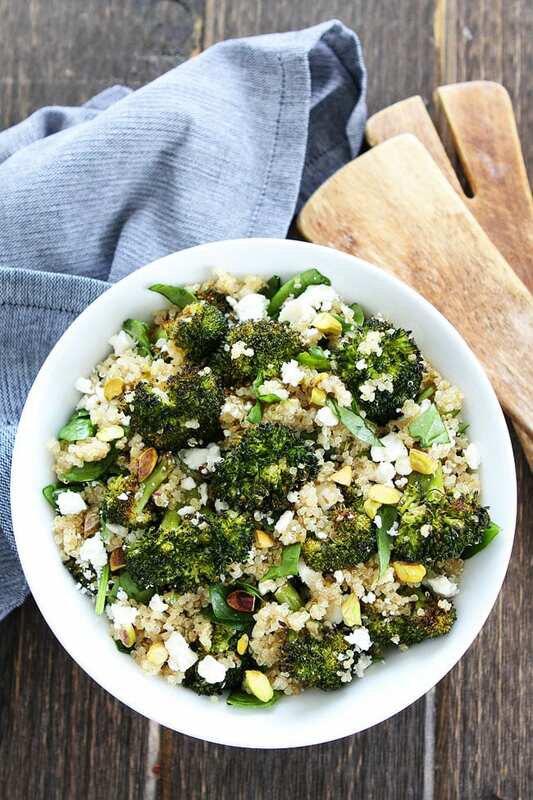 Roasted Broccoli Quinoa Salad-quinoa with roasted broccoli, spinach, pistachios, green onion, lemon, and feta cheese. This healthy salad is great as a side dish or main dish. If you haven’t tried my favorite Roasted Broccoli recipe, what are you waiting for? It is the BEST way to eat broccoli. I have been making it every day for about a week, you know to start the new year off right. I love eating roasted broccoli plain or along side any meal, it goes great with anything. This time, I decided to mix things up by making a salad with my roasted broccoli. I am so glad I did because this Roasted Broccoli Quinoa Salad is my new favorite salad. You have to try it! The base of the salad is quinoa. I love using quinoa because it is healthy, hearty, and a good source of protein. I don’t do wimpy salads. I don’t want to walk away from my salad feeling hungry and I promise this salad will leave you satisfied. 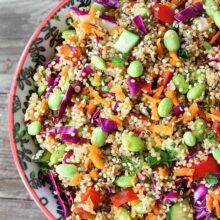 Quinoa is easy to make and here are my tips for cooking perfect quinoa every single time! Place the quinoa in a fine-mesh strainer and rinse under cold water.Rinsing removes quinoa’s natural coating, called saponin, which can make it taste soapy or bitter. Drain. For one cup of quinoa, you need 2 cups of liquid, water or broth. Cooking the quinoa in broth will add more flavor, but water is fine too. In a medium saucepan, combine water or broth, the rinsed quinoa, and salt. Bring to a boil. Reduce heat to low and cover with a lid. Cook for 15 minutes. Remove from heat and let stand for 5 minutes, covered. Remove the lid and fluff the quinoa with a fork. Serve! Once the quinoa is cooked your broccoli is roasted, you can build the most amazing salad. 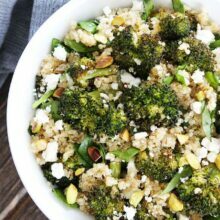 Place the quinoa in a large bowl and add the roasted broccoli, spinach, green onion, a drizzle of olive oil, squeeze of fresh lemon juice, chopped pistachios, and feta cheese. Season with salt and pepper and that is it! The salad is done and ready to be eaten…my favorite part:) If you need the salad to be vegan, you can leave off the feta cheese, it will still have plenty of flavor. 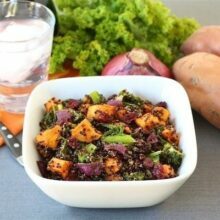 Enjoy this salad for a healthy lunch or dinner! It reheats well, so make sure you save the leftovers. And I even ate it cold the next day and it was still good! This salad is a winner all-around! 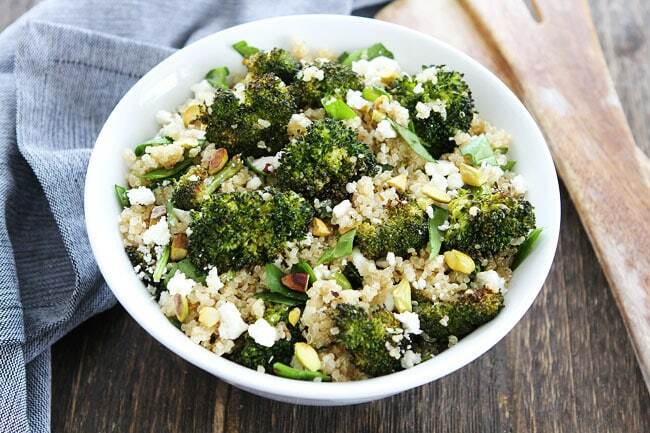 Make healthy eating easy this year and make this Roasted Broccoli Quinoa Salad. It is so good you will forget that it is good for you! You will want to eat it every day…at least I do! Enjoy! 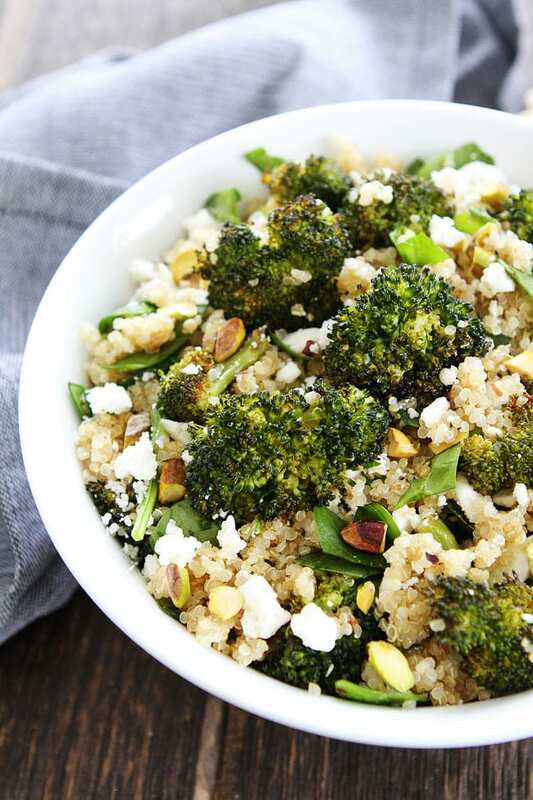 Quinoa with roasted broccoli, spinach, pistachios, green onion, lemon, and feta cheese. This healthy salad is great as a side dish or main dish. In a medium saucepan,bring quinoa and water to a boil. Cover, reduce heat to low, and simmer until for 15 minutes, or until quinoa is tender. Remove from heat and let stand for 5 minutes, covered. Remove lid and fluff with a fork. Transfer quinoa to a large bowl. Add the roasted broccoli, spinach, and green onion to the quinoa. Drizzle with olive oil and fresh lemon juice. Gently stir. Add the chopped pistachios, feta cheese, and season with salt and black pepper, to taste. Serve. Gorgeous photography, Maria! Is this on your porch? You’ve gotta do this more often! Also, the site looks amazing. It must be such a relief to have it done. Congrats!!! I think roasting pretty much makes most things better! Looks Wonderful !! Love the new site !! 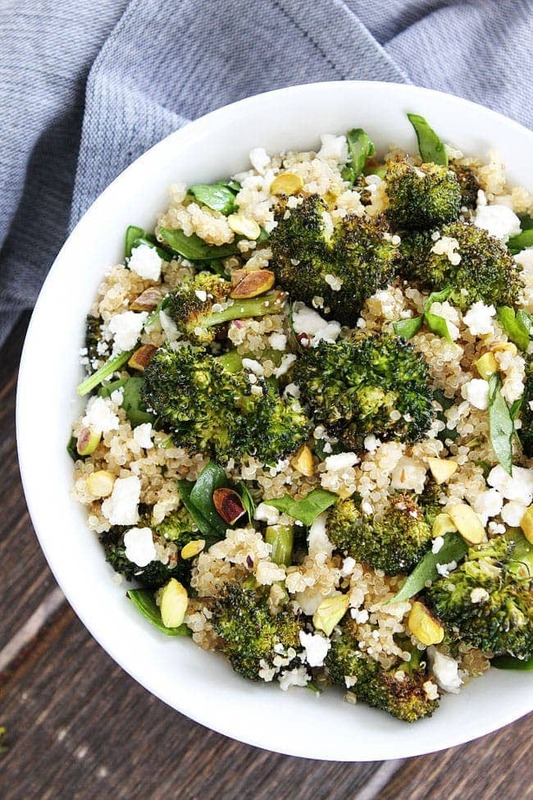 Love the use of the roasted broccoli in this quinoa salad!! What a delicious idea for dinner! You just can’t go wrong with a salad like this! Can you use left over broccoli? I am making roasted broccoli for dinner and it would be so much easier to make enough for tomorrows salad at the same time. Thanks. Yes! I do that all of the time! Easy peasy! This looks delicious! I love the addition of feta and pistachios! 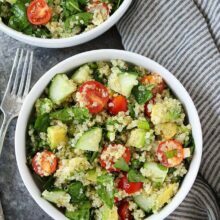 Made this tonight using tri colour Quinoa, substituted cashews in place of pistachios and threw in mini fairy tomatoes from garden. ( have glut of tomatoes at present) Recipe got the thumbs up and daughter took the remainder home for her work lunch tomorrow! Served it with a spicy chicken breasts, great combo. Will definitely be making this again. So glad you and your daughter liked the recipe! Wondering if this is meant to be a cold or warm salad??? With the addition of uncooked spinach, I am thinking it’s intended to be cold? 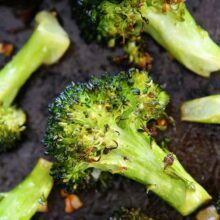 Roasted broccoli is a family favorite! I like to serve it warm or at room temperature, but I’ve eaten the leftovers cold and it’s good too! Thank you for the delicious recipe !! I decreased the quinoa by about half and added a shredded chicken breast- less carbs and more protein. Overall, totally delicious! I can’t wait to eat the leftovers tomorrow! Mahalo! I will try it. Made this for dinner this evening …….DELICIOUS! Thanks! It is my new favorite! I just made this for lunch, and it was excellent! Thanks for sharing. I made this fOr dinner and it was WONDERFUL! I used goat cheese and added some red pepper flakes. Will definitely make it again! I made this for Easter dinner for the first time and LOVED it. I added fresh mint which went well with the lemon dressing. thanks! I love using quinoa. I am also keen about protein in my salads to keep me full. This looks delicious as well as good and healthy. I’ll try it. I’m looking for a new healthy salad recipe for lunch. This looks delicious. Quinoa salads are my favorite. Can’t wait to try this. Just made this recipe yesterday. It was tasty. Even my mom liked it, and she doesn’t eat anything “weird.” It is really easy to customize as well. I had some left over broccoli and cauliflower I needed to use up, so I roasted them together and threw them in the salad. I actually like the roasted cauliflower best, so next time I will use all cauliflower instead of the broccoli. Also, I am not a fan of olive oil. The flavor is just too strong for me so I used vegetable oil instead. This will be going into my regular recipe rotation. A question: Is there a way to print up the recipes with their nutritional information? I have two different autoimmune conditions plus I am trying to lose weight so the information would be handy. Wonderful recipe! I just made this to have for lunches this week. We have a nut allergy in the house so I added black beans and left out the pistachios. It will be a nice change from my standard green salad lunch! This is such a delicious dish! One of my favourites to have. Easy to make, healthy and tasty! This is soooo yummy! I used sauteed kale instead of spinach and toasted pumpkin seeds instead of pistachios, since that’s what I had on hand. I used only 3/4 cup quinoa, but the same amount of dressing. Delish! This looks delicious! Might try it with goat cheese, not a huge feta fan:). Roasted broccoli is a staple in my house, my fiancé won’t eat it any other way! Are you still working on your cookbook. This looks so good, I’m going to have to try it. This salad has all of my fave green goodies! I don’t have a favor quinoa dish, but I’m loving the broccoli quinoa dish. Has all my favor things. Will be making this dish. Hi I have been super into roasting veggies, so good, but I had a quick question. I meal prep/try to for five days of work lunches, whenever I make this on a Sunday, the veggies are soggy by Tuesday/Wednesday, and tips to keep them from getting soggy so I can enjoy something like this or the Buddha bowl for lunch all week so I’m not roasting veggies every single night?? ?